Bullying is a real and pressing issue in our schools and online, and children with autism spectrum disorder are especially at risk. In the most recent volume of the Work in Progress Companion Series, Doctors Leaf, McEachin and Taubman explore not only the reasons that children with ASD are targets for bullying, but more importantly, they offer realistic and attainable strategies for kids on the spectrum. 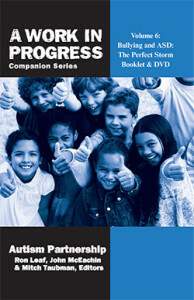 This week only, save 15% on the important new booklet and DVD – Bullying & ASD: The Perfect Storm – by entering the promo code BLOGBASD2 at checkout. *Offer expires on April 30, 2013 at 11:59 pm EST. Not compatible with any other offer. Be sure there are no spaces after the Promo Code when you enter it at checkout. Written by: Different Roads to Learning on April 23, 2013. This entry was posted in ABA, autism, Autism Awareness, autistic spectrum disorder, Behavior, Difflearn Promo Code, Pick of the Week, Products, Sale and tagged ABA, Applied Behavior Analysis, autism, Autism Awareness, autism education, Autism Partnership, autistic spectrum disorder, Bullying, Bullying and Autism, Cyberbullying, John McEachin, Mitchell Taubman, Ron Leaf, social skills by Different Roads to Learning. Bookmark the permalink.